You can find various species of quail throughout the northern hemisphere. Quail share a family with pheasants, another small game bird species. In the wild, they eat a diet of mostly grain. They do eat other foods, particularly as youngsters. In captivity, farmed quail have a few requirements for feed that require special consideration. Depending on the species, the individual and the time of year, about 90 percent of the quail diet comes from plant material. The bulk of this, roughly 80 percent of the adult quail diet, comes from seeds and grains. They eat other plant material and sometimes insects. By eating foods other than grains, quail ensure that they are getting trace elements and other nutrients they need. In addition to grains and seeds, most of the rest of a quail's diet comes from other plant material. Leaves and other roughage compose about 20 percent of the vegetable matter of a quail's diet. However, quail will also eat fruits and berries when they can find them. Many of the specifics vary based on the exact species of quail and where it's living. For example, desert species, like Gambel's quail, will eat cactus fruit when it is in season. When quail hatch, their diet is different from that of adult quail. For the first few weeks of their lives, quail chicks almost exclusively on insects before transitioning to the mostly vegetarian diet of the adults. However, adults do continue to eat insects as a small part of their diet. 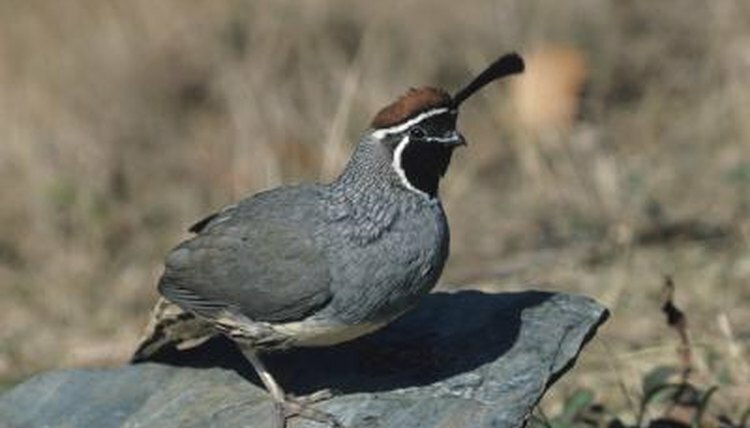 Adult quail typically eat more insects near breeding season for extra protein. The exact insects vary by the time of year and region. Some farms are starting to raise quail in captivity for food. Standard feeds for game birds work well for quail. However, there is a caveat. The feed has to have a consistent particle size. If different kinds of grains and food are different sizes, quail tend to fixate on the average-size particles and ignore the rest. This can cause dietary deficiencies if the smaller or larger particles have different nutrients. What Type of Feed Do Roosters Eat? Are Cardinals Omnivores or Herbivores?